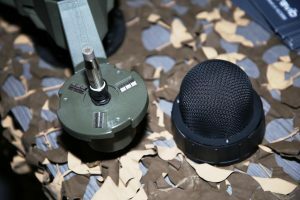 In mid-May the French Defence Industry presented some of the innovation it will show at the 2018 edition of Eurosatory. 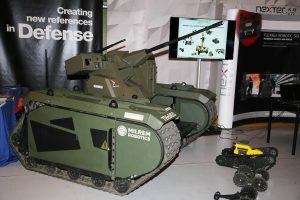 As only a few hours are left before the inauguration of the 2018 edition of what has become the benchmark for land defence exhibitions, it is the right moment to provide our readers with an “appetizer” of what they will find at the Parc des Expositions in Villepinte, at least in some of the French industry stands. It goes without saying that the French star will be the Jaguar 6×6 armoured reconnaissance vehicle, both prototypes produced until now being on the show, one at the French Army stand and the second on the Nexter premises. A mock-up of the VBMR (L), the light (over 15 tons . . .) 4×4 should also be unveiled at Eurosatory; still unnamed, we expect Mrs. Florence Parly, the Minister of Armed Forces, to announce the name chosen for the new vehicle during her visit on Monday 11th when she will inaugurate the exhibition. For more information on the Jaguar click here and on the VBMR (L) click here. 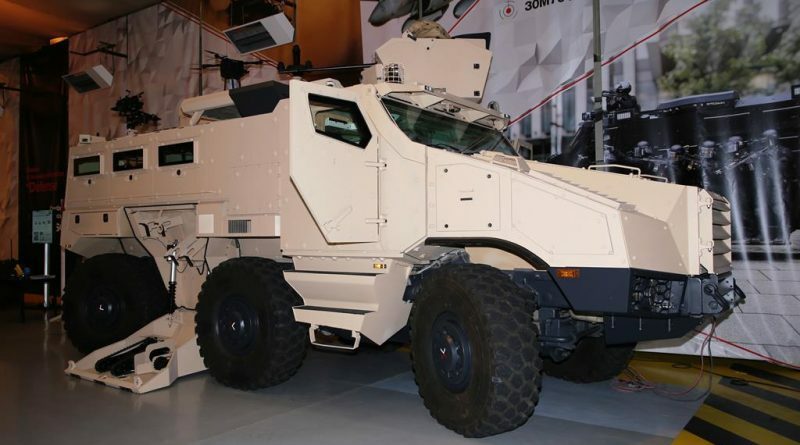 Coming to the rest of the equipment exhibited at Satory in mid-May, the biggest item on exhibition was Nexter’s “Augmented Titus”, which had a number of additions to increase its reach in terms of reconnaissance capabilities but not only. For example, the ARX-20 turret can now be operated from a tablet, so the operator can dismount and move and fire the turret from the ground. On the right side a clamshell compartment contains one tracked and one wheeled Nerva UGVs. 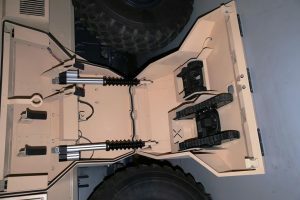 It opens sideways to release the two UGVs, which can be used for recce purposes. On the roof a captive drone was visible; this tethered solution is proposed not only for surveillance but also for target acquisition in artillery vehicles. Another ARX-20 was visible, mounted on a THeMIS (Tracked Hybrid Modular Infantry System) tracked ground robot, the system still waiting for a name becoming the first western –European UGV armed with a 20 mm cannon. It also carries a 7.62 mm machine gun, the main cannon having 100 rounds available. 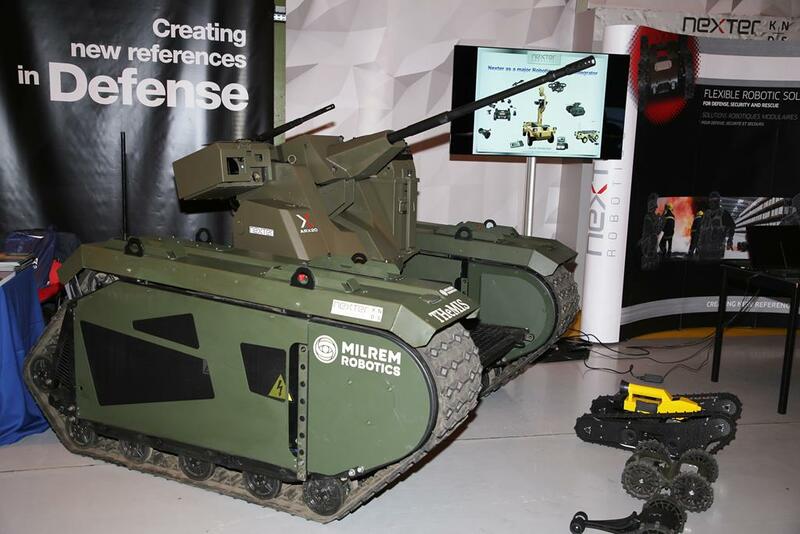 Nexter Robotics is currently working on securing data links, especially the one used for the turret. The company looks for a first demonstration to the French DGA by the end of this year. 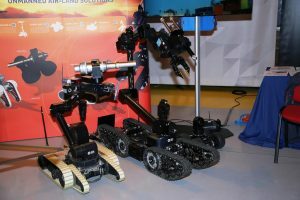 Part of the ECA Group robotic portfolio was present at Satory, and precisely the UGV Cobra MK2, the Cameleon and the latest generation Iguana. In December 2017 the latter has won the SMINEX contract with the French DGA, together with CEFA and Scopex, for a complete EOD and C-IED clearing solution, the overall contract value being of over 30 million Euros. 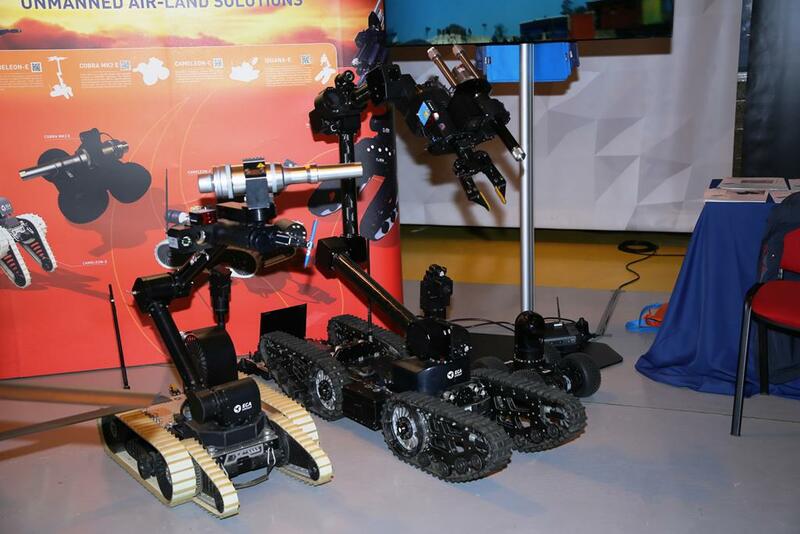 A 45 kg robot with a 40 kg payload, it can be fitted with a 6-axes or 8-axes robotic arm. 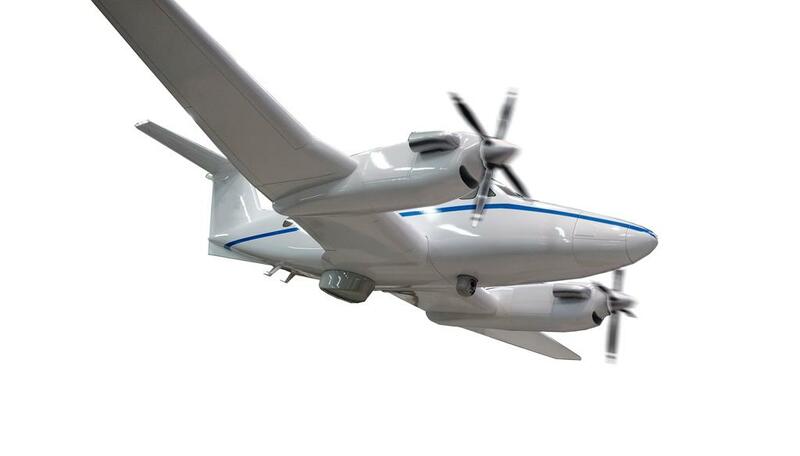 Electrically powered, with 2.5 hours endurance, it reaches 6 km/h and can lift up to 20 kg. 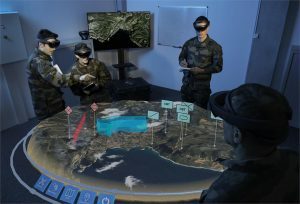 Exploiting augmented reality, Airbus Defense and Space developed a Holographic Tactical Sandbox; wholly virtual, it requires only a small server and goggles, the company being teamed with Microsoft and thus using the Hololens, being currently the only European partner to the US giant in this field. Through the goggles it is possible to observe a 3D map of the area of interest, with added tactical signs, the various actors around the table being able to operate in a collaborative way, something that can be made also with other users at distance. Attack directions, contact lines, objective areas, can also be created, while visibility can be checked thanks to the 3D. 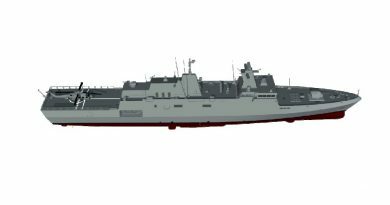 The project is in the development phase and Airbus looks forward to demonstrate it to the STAT in Mourmelon before year end, and to have it ready for the market within 18 months. 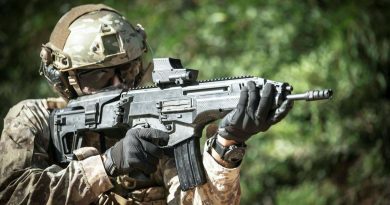 Atos, the company that is developing the SICS, the C2 core of the Scorpion French Army programme, acquired in April 2018 Air Lynx, specialised in deployable LTE solutions. 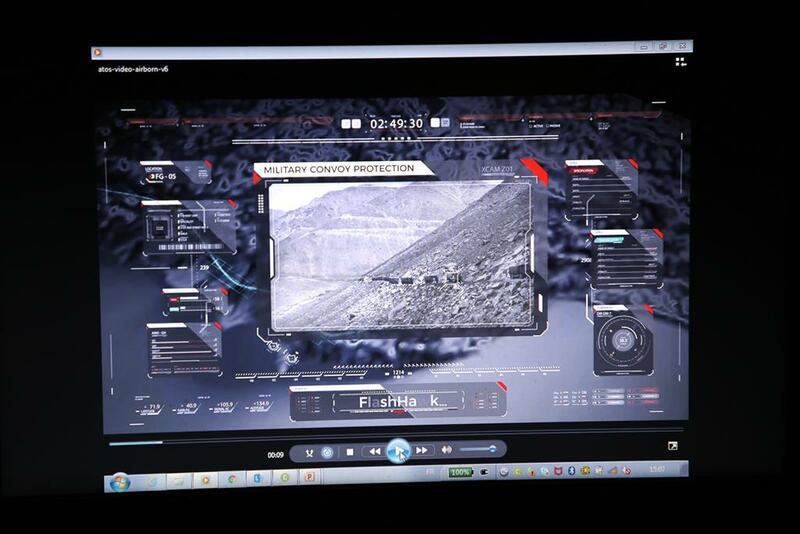 Apart from the latter products, it exhibited its “Hoox for mission” smartphone system. Both such systems were presented during the GICAT Innovation Day of October 2017 (see www.edrmagazine.eu). What was new at the May meeting was the FlashHawk, an airborne ISR solution developed by Avantix, also part of Atos, that combines collaborative SIGINT and electro-optic sensors. 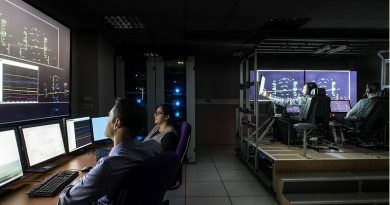 The SIGINT suite can pick up an undisclosed number of PMR, GSM and SATCOM telephone signals in the 30 MHz to 3 GHz band; the electro-optical turret is slaved in the direction to acquire the target providing its grids, which are then distributed through the net. One of the key elements is the small antenna pod, the system being light enough to be installed on tactical drones, such as Safran Patroller, as well as on civilian aircraft. Currently the FlashHawk is being tested on board a captive balloon; it will be installed on an aircraft before year end for further testing, its validation being expected by late 2019. The provider of the chassis for the future VBRM (L) vehicle for the Armée de Terre, Texelis has been for long a specialist in modular bridges for mobility. 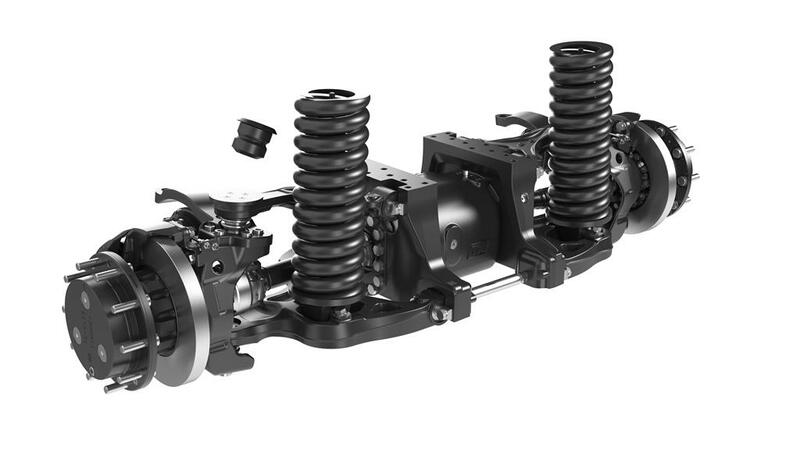 Nowadays it moved into the independent suspensions field, and is providing its solution to numerous OEMs. Beside the chassis for the future French light armoured vehicle, Texelis continues to look at the export market, and at Eurosatory will exhibit its new chassis that is proposed to vehicles manufacturers. It will be available in two versions, 14 and 18 tons, the TXP 14 and TXP 18, using respectively Timoney designed T700 and T900 axle systems. They feature independent suspensions, a Cummins 6.7 litres engine providing 350 hp coupled to an Allison 3000 SP automatic gearbox, and CTIS. Finally Metravib, the specialist in acoustic detection part of ACOEM, will not show new products but will rather start to integrate from scrap it systems into vehicles. It is also working on new algorithms that should allow answering customer’s requirements, such as identifying shots from 40 mm cannons, 105 or 120 mm antitank guns, RPGs and mortars. As said, these were only “appetizers”, so do expect to find much more while touring Eurosatory. For those who will be unable to attend, the EDR Magazine team will do its best to provide you daily with updated information on the show.